The Trump presidency is a test. Institutions like the courts, the news media and the business community have all been tested. Now it's the NFL and the NBA's turn. The president is embracing an "us versus them" conflict involving politics, patriotism and popular American pastimes. And there is an unmistakable racial element at play, since he is targeting prominent black players. On Friday night, seemingly out of nowhere, President Trump criticized the National Football League broadly and athletes who kneel during the national anthem specifically. Analysts are now predicting further on-the-field protests at games. Trump waded into controversy with another league on Saturday morning. On Twitter he criticized Golden State Warriors star Steph Curry, who intends to skip the traditional NBA champs celebration at the White House. "Stephen Curry is hesitating,therefore invitation is withdrawn!" Trump wrote twenty minutes after "Fox & Friends" mentioned the issue. NBA great LeBron James responded by calling the president a "bum" who misled his followers. "U bum @StephenCurry30 already said he ain't going! So therefore ain't no invite," James tweeted. "Going to White House was a great honor until you showed up!" Trump's remarks renewed the accusation made by ESPN anchor Jemele Hill a week ago -- that Trump "is a white supremacist." 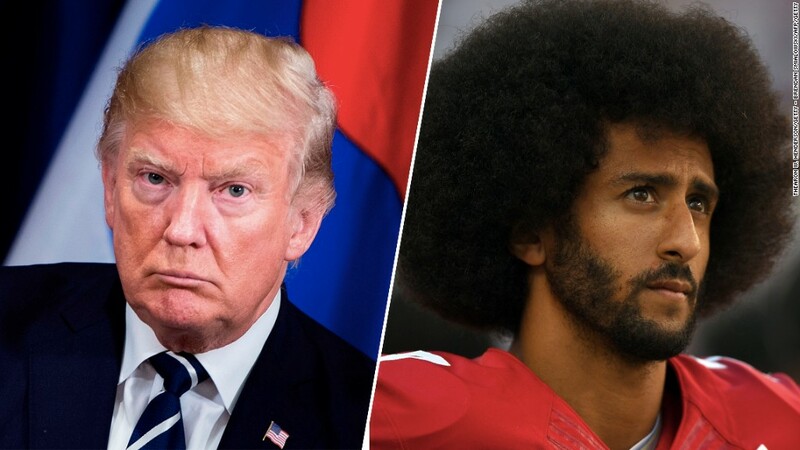 CNN's Jake Tapper wryly tweeted on Saturday that Trump is "focusing like a laser on the major problems of the American people: black professional athletes with opinions." The anthem protests, which began when Colin Kaepernick kneeled during the national anthem last fall, seemed to come up randomly while Trump was rallying an Alabama crowd to support Luther Strange in a primary election. The president followed up on Twitter Saturday afternoon. "If a player wants the privilege of making millions of dollars in the NFL,or other leagues, he or she should not be allowed to disrespect. ... our Great American Flag (or Country) and should stand for the National Anthem. If not, YOU'RE FIRED. Find something else to do!" Opponents of Trump accused him of failing to respect the First Amendment rights of Americans. Trump also said NFL ratings are down "massively" (that's not true -- the ratings are only down modestly) and criticized the NFL's efforts to make the game safer for athletes. "There's a more important issue about the health of young, American athletes. And obviously the president wasn't too concerned about that," CNN sports analyst Christine Brennan said after the rally. The president finished his NFL critique by saying it hurts the game "when people like yourselves turn on television and you see those people taking the knee when they're playing our great national anthem." In response, Mike Allen of Axios wrote Saturday morning, "To address a largely white crowd as 'people like yourselves,' and refer to protesting athletes, often African American, as 'those people,' does nothing to heal the wounds of Charlottesville." NFL commissioner Roger Goodell issued an unusual statement about the president's remarks, criticizing the "divisive" comments without calling out Trump by name. The NFL players union spoke out more forcefully. And Seattle Seahawks cornerback Richard Sherman, an active Twitter user, responded Saturday morning: "The behavior of the President is unacceptable and needs to be addressed. If you do not Condemn this divisive Rhetoric you are Condoning it!!"